BEAUTY: My First ColourPop Order! I love a good inexpensive beauty find more than anything (sorry friends & fam) and I'd had my eye on ColourPop for ages before finally treating myself to some birthday goodies a few months ago. First, I tried three eyeshadows: two shades are Super Shock Shadow (Weenie and Telepathy from the KathleenLights Collection) and the other, Fantasy, is a Super Shock Pressed Pigment. Sleek twist-open pots offer a clear window so you can quickly see what's inside. The formula itself is almost beyond description. It's a powder, but it has such a soft feel that you'd swear it's a cream. The only thing I can compare it to is the feeling of perfectly moist soil - definitely a solid, but you can easily leave a fingerprint on the surface. Swirling a finger in the pot gives a wondrously pigmented result and the softness makes it a dream to blend. Sorry, my impatient toddler fingers smushed 'em all. Swatches of Weenie, Telepathy and Fantasy...ARE YOU KIDDIN' ME?! As you can see, the color is deep and beautiful. Like, seriously beautiful. Like, dipped-my-fingers-in-liquid-metal beautiful. I wore Weenie basically every day for weeks after I got it, and I still reach for it all the time. Telepathy is great for gilded smoky eyes, and Fantasy is always going to make a statement, and that statement is "Check out my eyes because they look AWESOME." You know I had to try some lip color, right? I've heard such mixed reviews on these matte liquid lipsticks, and now I completely understand why. I don't know if I love them or hate them! My first try-on was Succulent, and I was shocked by how dry and strangle-y it made my mouth feel. I can handle some dry lips - I love longwearing mattes - but this was by far the most Death Valley-esque lipstick I've tried. I felt like I'd sucked on a stick of chalk, a feeling I remember from when I used to dress up in my sister's elbow-length prom gloves and pretend to smoke chalk "cigarettes" and drink champagne, as most seven-year-olds do. Oh, just me? All of the shades gave me this overwhelming dryness and usually crumbliness on the first go, but I found on subsequent wears they were much more comfortable. Maybe I just knew what to expect or maybe they needed to air out a little, but I do find myself wearing them regularly. I especially love Lychee because the purple hue is so bright and bold, but I've found LAX to perform the best of the bunch. Definitely exfoliate your lips and put a good balm down before playing with these guys! Again, the shades are beautiful. Succulent is a great orange-y red, which is somehow toned down and neon all at once. LAX is the perfect dramatic blood red color. 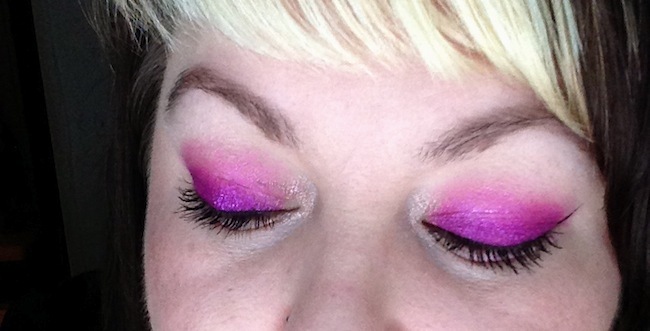 Lychee is bright and fun, but still really wearable. 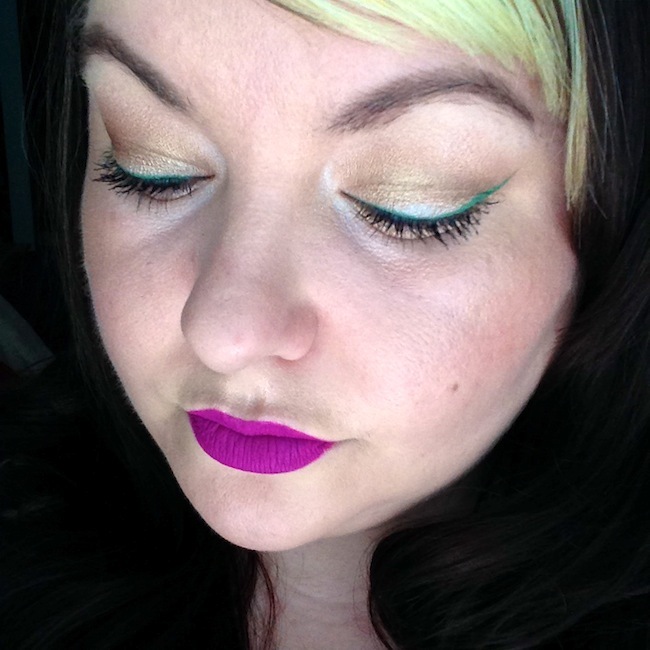 Dr. M is a very deep green, perfectly matte but also full of microscopic glitter. I'm glad I gave into the hype and tried this brand, though I'll likely stay away from any more matte lip colors just to be safe. For such a decent price they really do have a lot to offer, and the delightful sensation of touching these eyeshadows is worth it alone! Have you ever ordered from ColourPop? What are your favorite affordable makeup brands? Got any offbeat color lipstick faves to share? YAS! I love your make-up reviews. I do watch beauty vloggers on Youtube, but you have such a hilarious way with words, and are such an amazing writer, something that can't translate to video. Love this!! Omg those eyeshadow colors are INSANE!!! That metallic glitter and glow! I need that this summer. I love love LOVE Colourpop products - the pigmentation is out of this world and quite affordable too! I love ColourPop! Looks like you picked up some great items too. Too bad you didn't care for the Ultra Matte Lip. They look great on you!